Declaration of a variable template. Definition at line 2861 of file DeclTemplate.h. Definition at line 2995 of file DeclTemplate.h. Definition at line 2996 of file DeclTemplate.h. Definition at line 2887 of file DeclTemplate.h. Definition at line 1009 of file DeclTemplate.cpp. Definition at line 998 of file DeclTemplate.cpp. Referenced by clang::ASTNodeImporter::VisitVarTemplateSpecializationDecl(), and clang::TemplateDeclInstantiator::VisitVarTemplateSpecializationDecl(). Definition at line 3011 of file DeclTemplate.h. Definition at line 3012 of file DeclTemplate.h. Create a variable template node. Definition at line 955 of file DeclTemplate.cpp. Create an empty variable template node. Definition at line 963 of file DeclTemplate.cpp. Definition at line 1004 of file DeclTemplate.cpp. Referenced by clang::Sema::ActOnVarTemplateSpecialization(), and clang::TemplateDeclInstantiator::InstantiateVarTemplatePartialSpecialization(). Find a variable template partial specialization which was instantiated from the given member partial specialization. D a member variable template partial specialization. 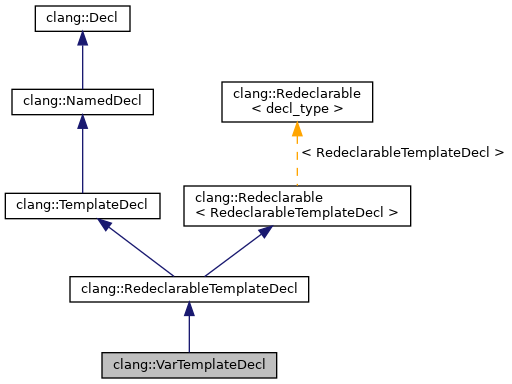 the variable template partial specialization which was instantiated from the given member partial specialization, or nullptr if no such partial specialization exists. Definition at line 1035 of file DeclTemplate.cpp. Definition at line 993 of file DeclTemplate.cpp. Referenced by clang::Sema::ActOnVarTemplateSpecialization(), clang::Sema::CheckVarTemplateId(), clang::ASTNodeImporter::VisitVarTemplateSpecializationDecl(), and clang::TemplateDeclInstantiator::VisitVarTemplateSpecializationDecl(). Definition at line 2936 of file DeclTemplate.h. Definition at line 2939 of file DeclTemplate.h. Definition at line 2894 of file DeclTemplate.h. Definition at line 945 of file DeclTemplate.cpp. Definition at line 2963 of file DeclTemplate.h. Definition at line 2955 of file DeclTemplate.h. Definition at line 2959 of file DeclTemplate.h. Definition at line 980 of file DeclTemplate.cpp. Definition at line 1024 of file DeclTemplate.cpp. Retrieve the previous declaration of this variable template, or nullptr if no such declaration exists. Definition at line 2945 of file DeclTemplate.h. Definition at line 2949 of file DeclTemplate.h. Retrieve the set of specializations of this variable template. Definition at line 974 of file DeclTemplate.cpp. Get the underlying variable declarations of the template. Definition at line 2906 of file DeclTemplate.h. Referenced by clang::Sema::CheckVarTemplateId(), getExplicitVisibilityAux(), clang::Sema::InstantiateVariableDefinition(), clang::Sema::MergeVarDecl(), and clang::ASTNodeImporter::VisitVarTemplateDecl(). Returns whether this template declaration defines the primary variable pattern. Definition at line 2912 of file DeclTemplate.h. Definition at line 969 of file DeclTemplate.cpp. Definition at line 986 of file DeclTemplate.cpp. Definition at line 3002 of file DeclTemplate.h. Definition at line 3006 of file DeclTemplate.h. Definition at line 2998 of file DeclTemplate.h. Definition at line 2899 of file DeclTemplate.h. Definition at line 2900 of file DeclTemplate.h.